I have come across several mentions of this gentleman on the internet but rather surprisingly do not know where he fits in to the family. Please contact me if you can provide me with any additional information about his family line as, at the moment, there is rather a large gap. All I know is that Henry died on 31st October 1969. The "Fighter Pilot Ace List" shows "Henry Woollett 36(35?) WWI UK" (the number refers to the number of aircraft shot down). The following information has been gleaned from other web sites with their permission for which we are grateful. From "Leech International - Heritage Of The Air Collection"
"Fifty feet above the Somme River, time ran out on the life of Manfred von Richthofen, Germany's greatest ace. Behind his red Fokker was Captain Roy Brown in a British-built Sopwith Camel. The Canadian was low on ammunition, but began firing as soon as he was within range -- and the treacherous Camel claimed another victim. When this stubby fighter was first introduced in 1917, it took more lives of Royal Flying Corps pilots than the Germans did. As the War progressed, the Camel chalked up an outstanding record of enemy kills: 1,6344 confirmed victories, including 99 balloons and a Zeppelin. Although the plane became the supreme Allied dogfighter of the war, only one Victoria Cross was won by a Camel pilot. The Camel was the favorite plane of many unsung British heroes. One of them was Captain H. W. Woollett, D.S.O., M.C. On April 12, 1918, Captain Woollett shot down three enemy aircraft before lunch, then scored victories over a Pfalz D111, a 2-seater reconnaissance plane, and a Fokker Triplane -- a feat seldom equaled and never surpassed." From "The Royal Air Force 2000 - History"
"Formed at Stirling from a nucleus provided by No 19 Reserve Squadron, it took almost year for No 43 Squadron to reach the Western Front in France. By this time their Sopwith 1½-Strutters were only suitable for reconnaissance work. Following re-equipment with Sopwith Camels in September 1917, the Squadron began to forge an excellent reputation for itself. This was typified by the events of 12 April 1918, when two of the Squadron's pilots, Captain JL Trollope and Captain HW Woollett, both scored six confirmed victories in a day. After the war, the Squadron moved to Germany briefly, returning to the UK in August 1919 prior to disbandment at the end of the year. No 43 Squadron reformed at Hendon on 1 July 1925. Now part of the UK fighter defences, it was equipped with Snipes, Gamecocks (1926), Siskins (1928) and Furys (1931)." From Southwold, Suffolk, the son of a doctor, Henry Woollett was a medical student at the outbreak of war, and was commissioned in the Lincolnshire Regiment in August 1914. A year later he took part in the Suvla Bay landings in the Dardanelles. In 1916 he transferred to the RFC and gained his wings after only three and a half hours of dual instruction. In November he was posted to 24 Squadron, flying DH2s. Woollett managed to gain a victory on this type before converting to DH5s, in which he claimed another four. In August 1917, after becoming a flight commander and winning an MC, he returned to England and became an instructor. In March 1918 he was posted back to France, joining 43 Squadron. 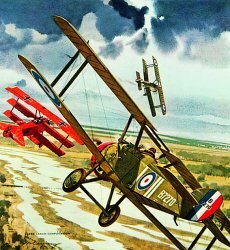 While there, he decorated his Sopwith Camel with a special spinner painted to represent the face of a Red Indian, while personally sporting a leopardskin flying helmet and gauntlets, which created quite a stir. Leading 'C' Flight, he brought his score to 35 by early August, many of these being balloons. Having received a DSO and a Bar to his MC, together with the French Legion d'Honneur and Croix de Guerre, he returned to England in August to command three training squadrons at Eastbourne. He served in Iraq in 1924, and commanded 23 Squadron in 1930-31. He died on 31 October 1969.